I always thought that since the Chinese invented the compass and the gunpowder, they should have been great navigators and explorers. I also always thought that they should have been among the first to navigate around the globe. What an amazing surprise when I learned that the most venerated Chinese maritime admiral Zheng He had reached the horn of Africa before Vasco da Gama, challenging the claim that VdG had been the first on the Eastern side of Africa. Indeed, Zheng He’s great armada rich of more than 300 ships and as many as 30,000 troops entered the coastal town of Malindi in modern day Kenya in 1418. He also visited Mogadishu and Barawa in present-day Somalia, and went as far as the coast Mozambique. It is said that he brought a giraffe from Somalia back to Emperor Yongle (1415). There are tribes in Kenya which have clear Chinese ancestry… they descent probably from some of Zheng He’s crew members. 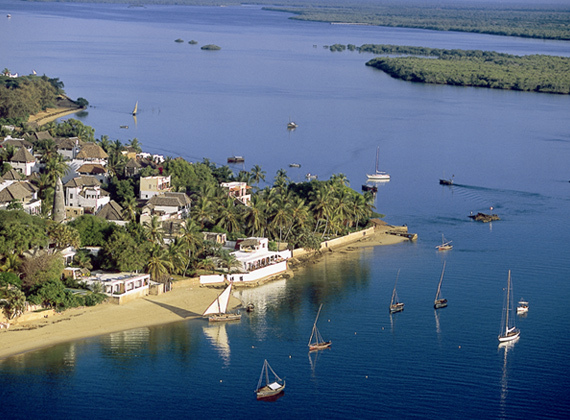 In 1999, a journalist for the New York Times, Nicholas D. Kristof, reported a surprising encounter with the Shanga people on Pate island, just off the coast of Kenya. There, in a village of stone huts set amongst dense mangrove trees, Kristof met a number of elderly men who told him that they were descendants of Chinese sailors, shipwrecked on Pate many centuries ago. Their ancestors had traded with the local Africans, who had given them giraffes to take back to China; then their boat was driven onto the nearby reef. Kristof noted many clues that seemed to confirm the islanders’ tale, including their vaguely Asian appearance and the presence of antique porcelain heirlooms in their homes. You can read his account entitled: 1492: The Prequel on the New York Times website. It is also reported that 7 centuries before the great admiral Zheng He, another Chinese, Du Huan, an officer of the Tang dynasty (618-907) visited the kingdoms of Nubia and Abyssinia (modern Sudan and Ethiopia respectively). He called these countries Molin-guo and Laobosa respectively. A full account of his trip can be found on Chroniques Yemenites. Check out the blog Curiosity killed the Eccentric Yoruba where the author did an outstanding job relating the Chinese presence in Africa, as well as African presence in China. Trade flourished between East Africa and China. As such, many African products could be found in Chinese courts such as ivory, giraffes, myrrh, zebras, camels, powdered rhinocerous horn (used as prized aphrodisiac), tortoise shell (used to treat consumption) and frankincense and ambergris (used as a tonic to stimulate circulation). Similarly, as said earlier, Chinese artefacts such as porcelain have been found in coastal villages along East Africa. Chinese coins from the Song and Tang dynasties have been found in Zanzibar, and a huge amount were found in the town of Kajengwa in Zanzibar, illustrating trade between China and early East African kingdoms (some from the Song period have also been found in Mogadishu as well as in Kenya). Chinese archaeologists arrived in July of 2010 to the beaches of Lamu and Malindi in Kenya, in search for a shipwreck from admiral Zheng He’s flotilla. Please watch this great video on the BBC website about the discovery of Chinese ancient coins in Kenya. The video below tells of Admiral Zheng He’s travel and the size of his armada. here, certainly like what you’re saying and the best way in which you say it.